Click the latest photos to see a larger version. Following a hugely successful run at the Chocolate Factory, 2012 saw a UK tour of Educating Rita. Matthew Kelly and Claire Sweeney star in Willy Russell’s modern classic, directed by Tamara Harvey. Rita, a young, brash hairdresser, has recently discovered a passion for English literature and enrols with the Open University. Her fresh, unschooled reaction to the classics challenges the attitudes of the University and her lecturer Frank who begins to question his own understanding of his work and himself. Matthew Kelly has worked extensively in theatre and television, winning an Olivier award for his role as Lennie in Birmingham Rep’s production of Of Mice and Men. Other theatre includes: Legally Blonde (UK tour), Buried Child (Leicester Curve), Waiting For Godot (Theatre Royal Haymarket), Spamalot (UK tour) and Lend Me A Tenor (Gielgud). Matthew’s television credits include Benidorm, Bleak House and Cold Blood, and he continues to enjoy a very successful career as a television presenter.
" Kelly is a fantastic character actor who possesses impeccable comic timing. He shines in the role of Frank. " Tell Me on a Sunday (UK Tour) and most recently as Paulette in the UK tour of Legally Blonde. Tamara Harvey directed Smash! at the Chocolate Factory in 2011. Other theatre credits include: The Kitchen Sink and Where’s My Seat (Bush), Tell Me on a Sunday (UK tour) and Dancing at Lughnasa (Birmingham Rep). The tour during the Summer of 2012 includes Malvern, Guildford, Glasgow, Bath, Aberdeen, Bradford, Richmond, Cambridge, Oxford and Brighton and then a residency at Edinburgh's Fringe Festival during August. Educating Rita, produced by the Chocolate Factory and Theatre Royal Bath, is a delightful re-working of Willy Russell’s clever study of character and emotion, liberally sprinkled with humour and delicious irony. Claire Sweeney plays the title role of the married hairdresser who at 31 and already familiar with the poetry of Roger McGough, is hungry to broaden her cultural horizons via the Open University. Matthew Kelly plays Frank, a one time poet and now a local university tutor, assigned to supervise Rita’s studies. Like fine wine, this play has improved with age. When first produced in 1980, the Thatcher era was established and the gap between rich and poor, acknowledged as a backdrop in much of Russell’s writing, was distinct. It is a sad reflection that many of today’s newspaper headlines echo similar themes, and that the play’s social comment is as relevant now as when it premiered. The original production and subsequent film, drew attention to the hitherto broadly unknown Julie Walters who had cut her acting teeth at Liverpool’s Everyman Theatre and who brimming with scouse grit, gave a performance as Rita that set the bar very high. (amidst numerous immaculately timed costume changes) charts this development in Rita with sensitivity and pinpoint perception. Matthew Kelly provides a worthy foil to Sweeney’s comparatively youthful impetuousness. In his tutorial sessions with Rita he discovers that the protective layers of his alcoholic character’s crusty and cantankerous protective shell are first penetrated and then, almost onion-like, stripped away by this mature student’s directness of purpose and irresistibly innocent charm to reveal a vulnerable and lonely man. Without meaning to, Rita steals his heart, and when, in Act 2, we see his jealousy of her newly acquired freedom, Kelly’s performance tugs at the heartstrings without being mawkish. In a similar vein, his portrayal of Frank’s sometime drunkenness is also delivered free of cliché. It is interesting to note that Kelly and Sweeney briefly performed together earlier this year, albeit not as a duet, in the tour of Legally Blonde. The pair have an onstage chemistry that clearly works, and it will be intriguing to see if this professional pairing is exploited in productions of the future. The creative team has excelled throughout in this touring production. Tim Shorthall’s set, with numerous bookcases, many of which conceal bottles of scotch is delightfully detailed, whilst Davy Ogilvy’s sound design, ensured that clarity of speech was maintained, even in the rear stalls. This show is a delightful two hours long, spent watching an actor and actress who are both clearly at the top of their game. Willy Russell's classic play Educating Rita opened at His Majesty's Theatre last night and enthralled the audience with its hilarious script and terrific performances by its stars, Matthew Kelly and Claire Sweeney. The play has constantly been performed all over the world since it's first staging in 1980 and was immortalised in the 1983 film starring Julie Walters and Michael Caine. 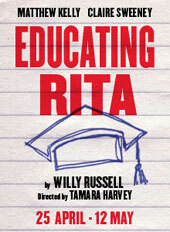 Russell's superb writing and characterisation - also present in his highly acclaimed works Blood Brothers and Shirley Valentine - make Educating Rita a firm audience favourite. In a clear nod to George Bernard Shaw's Pygmalion, Russell tells the story of Rita, a young woman trying to better herself through education. She is taught by Frank, a curmudgeonly academic with a fondness for whisky. Whilst Rita does indeed learn about the wonders of literature from Frank, it is what they come to teach one another about themselves that is at the heart of the play. Matthew Kelly is arguably best known for presenting the television talent show Stars in Their Eyes. However, the majority of his remarkable career has been on stage, his undeniable acting talent even earning him an Olivier Award for Best Actor. In Educating Rita he completely inhabits the character of Frank, Rita's disillusioned yet inspiring tutor. He epitomises the quintessential academic and seems so perfectly at home in the character and his surroundings that you feel he has been lounging in his desk chair for years. Despite still being remembered for her role in TV soap Brookside, Claire Sweeney is also no stranger to the stage, having starred in many productions including the one-woman show Tell Me on A Sunday which came to Aberdeen last year. As Rita she draws on her natural Liverpudlian accent and her flair for comic timing. She is at once eager to learn and terrified of what this might mean. Sweeney handles this with ease and charm, providing many laughs for the audience. All the action takes place in Frank's study. This might have posed a challenge, in a production that only has two actors, to keep the action interesting. However, the set is so beautifully realised that it could entertain the audience on its own. It is a perfect professor's study, crammed to the rafters with books and housing the ubiquitous academic's desk covered with papers. It is so vivid that one can almost smell the pages of the old books and the traces of Frank's whisky lingering in the air. The production team also deftly handle the passage of time by subtly altering the tree outside the study window to reflect the shift in seasons (plus the odd change of cardigan by Kelly). The actors' performances also aid in demonstrating the passage of time, as with each scene their characters grow ever more comfortable with each other. What makes Educating Rita so memorable is that it reminds the audience that education can be exciting and liberating. It also tenderly shows that true friends can grow separately without growing apart. That, and its incredible funny. Claire Sweeney is extremely well cast as Rita, putting her own stamp on this loveable role. I went to the theatre wondering whether I would be able to see this production without thinking of Julie Walters in the 1980s film. After the first fifteen minutes I was drawn straight into the story and was stunned by the strong characterisation. Wearing an ‘eighties batwing jumper, leggings and legwarmers, Liverpool born Claire Sweeney morphs effortlessly into the role. The only thing missing are the white stilettos and a frizzy perm (de rigueur in the ‘80s era of the New Romantics – a time when everyone went to discos and listened to Soft Cell, the Human League and drank Snakebites and Pernod and Black). Costume Supervisor Brigid Guy and Wardrobe Martin De Cerjat look like they’ve had fun with this production! Ms Sweeney already has a natural Liverpulian accent and dynamic stage presence; she tints hairdresser Rita’s personality with a tenacious, brassy colour, presenting her as gobby and unashamedly direct. There’s a hilarious moment when she misinterprets the title of “Howards End” - E.M. Forster’s classic novel, leaving her heaped in laughter. What is most striking about Claire Sweeney’s performance is her ability to change Rita throughout the story. Rita’s character blossoms thanks to her friendship with drunken tutor Frank and from the knowledge and opportunities deriving from that friendship. The old Rita is not left behind, but Dr. Frank Bryant misses the young woman who first walked into his dusty old office. There are some wonderful dynamics between Matthew Kelly and Claire Sweeney, particularly towards the end; comedy turns to drunken panic when he realises they will be parted. Just as Rita’s taste for education grows, her character flowers until she becomes a more thoughtful Rita with a craving for travel, theatre and other opportunities. Much to the horror of her professor, she gives up cigarettes. Claire Sweeney’s exceptional performance is hardly surprising, given her diverse stage and television credentials, most notably as Lindsey Corkhill in Brookside in 1991; Roxie Hart in Chicago; Miss Adelaide opposite Patrick Swayze in Guys and Dolls; Paulette in the UK tour of the Legally Blonde and the 2011 production of Andrew Lloyd Webber and Don Black’s one-woman show Tell Me on a Sunday. Matthew Kelly is a tremendous actor and his performance as Frank is Kelly at his best. Matthew Kelly has won numerous awards, including winning a Royal Television Society Award for Best Performer in a Drama and a Silver Medal in the New York International Programming Awards - both of these were for Cold Blood. Kelly won his Olivier Best Actor Award for his role as Lennie in Birmingham Rep’s Of Mice and Men. Kelly has a string of television and theatre credits to his name, having appeared in anything from Shakespearean roles to acting in plays written by Samuel Beckett, Alan Bennett and Alan Ayckbourn. Claire Sweeney and Matthew Kelly are on stage together continuously for the entire play. The dialogue is fast, the story is punchy and sincere and the characters are loveable. Tamara Harvey’s direction together with Assistant Director Olly Hawes is superb. The direction is not overstated, since there are just two characters on stage throughout, and has been carefully balanced. Too much direction could look overdone – instead, it focuses on mannerisms and body language. Most importantly, there is emphasis on relationship dynamics. The clever set consisting of bookcases, a door to the office and a window with a tree outside gives the impression of an Oxford University setting. Everything in this production from the set Design by Tim Shortall, Set Construction (RK Resource) and Props (Jemma Gardner) is beautifully worked into this production. I particularly loved the dismal grey filing cabinets and old fashioned radio and telephone – touches from a bygone era before the digital age. The set works particularly well on the Yvonne Arnaud’s stage – a larger theatre could swamp the intimate storyline. The Lighting Design by Paul Anderson with Lighting Equipment provided by Sparks Theatrical Hire and Sound Design (Davy Ogilvy) with Sound Equipment from Blitz, is again carefully balanced, creating harmony to the overall production. The sound and music work well leading from scene to scene, adding definition to the storyline. Educating Rita is a play that all generations can relate to. We’ve all been in situations where we want to change our lives and reach for something else – and the credit-crunch should not prevent this, even if the journey takes longer. Rita makes those changes; she challenges psychological boundaries by ripping away restrictive blocks and relationships, even when it means losing the familiarity of her old life. Rita shows that you can start again and there are always possibilities in life. Life isn’t about getting a university grant or having fees paid for or using anyone as an excuse not to try something new. This play is one of choices and the route taken to find a better life, however hard. Rita isn’t just a heroine for hairdressers, secretaries and workers of every kind who feel trapped – the ballsy Scouser is inspiration for anyone wanting to change their lives. Above all Educating Rita is highly entertaining. It’s a show that everyone will love. Tamara Harvey’s perfectly cast production of Russell’s classic comedy drama is a highly satisfying mixture of laughter, pathos and brilliantly written dialogue, with Claire Sweeney a made-to-measure Rita. She’s sharp, outspoken and honest, and so comfortable in her home-grown Scouse accent that she sometimes runs off at the mouth with a speed which needs concentration for southerners to follow, but does that matter when we are as intrigued with her as Frank is? and the audience were so totally engrossed that they applauded every scene—and there are many. Almost biographical in its content, (Russell has been both a hairdresser and a teacher) this two-hander finds hairdresser Rita, believing that there must be more to life than marriage, babies and new dresses, determined to “find herself” and get an education so that she can be in control of her own destiny and have choices in life. Enrolling in the Open University, she meets her tutor Frank—“a crazy mad piss artist who wants to throw his students through the window”—and the story is their developing relationship, her improving education and his renewed interest in teaching a pupil who is both a challenge and a reward. Learning has its problems: Rita, finding an excitement and joy in great literature, can no longer relate to those in the life she has left, and neither can she talk knowledgeably in the life she aspires to, but she perseveres and her thrill and joy when she find she can talk and argue with the other students transmits itself to the audience. We are with her all the way from nervous beginnings to triumphant success and a life full of promise and choice. 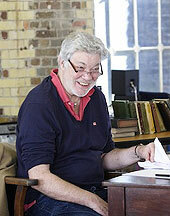 The bored and disillusioned Frank is played by Matthew Kelly, also expert at showing his inner feelings. Rita coming back from Summer School has discovered the poet Blake and is now “dead familiar with Chekhov”. This is the first sign that she is not dependent solely on his guidance and his disappointment is obvious. As most of Glasgow soaked up the rays in the last day of the heat wave, the audience took their seats last night in the, unexpectedly, cool Theatre Royal. Given that we don't get much sunshine up here it's a credit to the superb piece that the audience willingly abandoned the beer garden and charred sausages for a night in a dark theatre. A piece with similarities to Pygmalion, it’s clear to see why it is so revered. Educating Rita is a stark reminder of the importance of access to knowledge and the social mobility that a good education allows. Written by Willy Russell, also known for Blood Brothers and Our Day Out, Educating Rita does draw on Russell’s own experiences growing up with limited opportunities and a life path that was clearly mapped out for him by social convention. Rita (Claire Sweeney) feels trapped in her working class life and access to Frank's (Matthew Kelly) literature course for her is an escape from the pigeon hole she feels allotted to but Frank has long since taken his own knowledge for granted and is more concerned about where his next drink is coming from than the pursuit of knowledge. The beautifully crafted set captures the audience's imaginations long before the play starts. Towering book laden shelves dominate the stage as the audience file in and almost invite you to grab a book off the shelves before getting comfy in a squishy armchair or perhaps settle in the bay window with a battered copy of Shakespeare and the sun streaming in. A calm air of knowledge and a hint of disorganisation seep from the tutorial room and easily provide a sense of its owner as Frank arrives and begins to root through the books by author searching not for a novel but a carefully hidden bottle of whisky. With shaggy grey hair and array of woolly jumpers, cardigans and vests, Kelly captures Frank's discontentment and disappointment with subtlety before slowly unravelling the facade as he pulls at the loose threads that barely hold the fabric of Frank's life together. Claire Sweeney quite literally bursts on stage and into Frank's life as the effervescent Rita. The transformation she undertakes on her journey for knowledge is remarkable. Sweeney takes the brassy Rita and creates a rounded, lovable character that you can’t help but admire for her tenacity and willingness to learn. Sweeney and Kelly have excellent chemistry and the relationship they create is heartwarming and credible. There is much to learn from Educating Rita and it certainly provided a timely reminder to me that theatre is not something everyone has access to and it should not be taken for granted. In a recession where many feel a bit trapped Rita's determination is a lesson and example to us all. So many revivals of late have felt the need to “revitalise” as opposed to just revive. Luckily Tamara Harvey’s production of Educating Rita has focused on the fact that the script has already been a success and has given it the best possible airing. The casting in a two hander like this is vital and in this production both leads make the most of the witty script. Matthew Kelly sets out his stall in the opening scene with Frank’s hunt for whisky in his office. His talent at portraying the irreverence and wit of this character shines through in his subtle delivery of dialogue, never looking for the laugh but ensuring that the audience never miss a beat. Director Tamara Harvey’s clever staging ensures the shortest of gaps between scenes, with no stage crew interrupting the flow to “clear the set”. This slow build-up of debris in Frank’s office along with the set being strewn with the beige discarded cardigans, waistcoats, jackets and other previous costume items only helps to build on the picture of a man with less control of his own emotions and self care. In contrast to the beige costuming of Frank and the staid setting of a lecturer’s office, Claire Sweeney bursts on the set with a vibrancy and natural energy that epitomises why Frank falls for Rita’s charms. The skilful accent work from Miss Sweeney to show the progression of Rita’s education is something that many might miss, and that in itself is testament to the talent. The chemistry between Miss Sweeney and Mr Kelly is very nice to watch. In the lighter scenes the flair for comedy from both actors is evident and both appear to genuinely enjoy each other’s humour. The contrasting heavier scenes were also delivered equally well and gave both performers a chance to show their “acting chops”. Tamara Harvey has cleverly used a variety of spaces on Tim Shortall’s set and this helped portray the dynamics of the power battle between the characters. The subtle lighting changes - from designer Paul Anderson - were also helpful in supporting the emotions on stage, in particular for Rita’s monologue after an argument with her husband. All of this dressing however would be nothing were it not for Willy Russell’s script. Although only just over 30 years old this is, in a sense, a “period” piece. Attitudes have changed, lifestyles have moved on however there are still divides of class and culture. Educating Rita however does not need to be seen as a political commentary of its time, but is instead a story of one woman’s struggle for acceptance and one man’s attempts to show her she doesn’t need it. However as is typical of Willy Russell, it is also the opportunity to deliver a lot of wit and humour. Once again it is great to see the London casts coming out to “the provinces” and although both are “names” from TV, it is clear that both were not cast on this basis, but instead because of their talent in their respective roles.